This past weekend, our youngest was playing soccer in the Bluegrass Games in Lexington, KY. The weather was great; sunny, mid 80's and a little breezy. During the three games my husband and I sat in the sun and enjoyed watching Benjamin play. My husband broke down and got the umbrella out, but not me. I love the sun. Guess who got burned. Nope, not me, him. Yes! My husband got sunburned. Me? Nothing, Notta! I really don't understand. I guess I'm so white, the sun reflects off me and onto him. Anyway....Saturday, we had an early morning game and an afternoon game. Afterward, we dropped Benjamin back at the motel to be with the rest of the team, and Bill and I went investigating. Lexington is really a beautiful place. Full of horses; after all it is the Horse Capital of the WORLD. I just love horses. As we drove around, we spotted the Kentucky Horse Park, and decided to drive through. It is a huge place. One of the first things we saw were these beauts. After we left this area, we decided to park the car and walk around. Of course there had to be a statue of Secretariat. Then we saw a little blurb about the walls that dot the area. We saw them everywhere around the city. They were built by slaves. If you click on the photo, you can read about the history. Finally we came upon another group of horses. And guess what!? One came and paid us a visit. I was so excited. It even let me pet it a bit. Then it was off to be with the rest of the horses in the pasture. After we went in a few of the buildings and found they were about to close, we decided it was time to go get something to eat. As we left the park, we met up with these two again. They were scratching each others back. Look at all the green horse pastures. I believe the soccer fields the kids played on use to be horse pasture. Here's some of that wall. You know that had to be a lot of work! The next day, we only had one game. It was over just after lunch, so we were able to head out and be home by dinner. On our way out of Lexington, we came upon this castle. How cool is THAT! It is actually a motel. I'm sure you could be their welcomed guest for a very pretty price. We all had a nice weekend, but I was glad to get back to my other boys, and Sox. As many of you know, I make jewelry. This is a shot of a necklace I made from buttons and old telephone wire. I live the colors of the wire! My husband likes stripes...navy blue strips. As I was putting his shirts away, I noticed more striped shirts. Green, red, yellow, etc. Some stripes were big and some small. I really never noticed it before until today when I kept picking up one navy blue strip shirt after another. One month ago today, we were moving in. Boy, was it a hot and dry day! I remember the weather man on the radio talking about how it was not the normal humid Kentucky summer day. It was more of a dry heat like they get out west. The dryness is gone and humidity is back. About noon, the temperature was 97 with a heat index of 109. Ewww! Here is our laundry room. Not much to it, except I did get a new washer and dryer. I feel like I'm playing a video game each time I fire them up. All the computerized bells and whistles. All I wanted was a basic washer and dryer; and these are as basic as they come these days. This view is right off the garage. This is the view from our breakfast nook area. It did have a door on it, but just before we moved it, the hot water heater broke and they had to get a new one. Boy, am I glad it didn't wait 'til we moved in. Anyway, once they installed the new hot water heater, it did not pass inspection because of the door, so they replaced the door with a louver door. We took it off so we could move our furniture in. I just might keep the door off. I have a feeling with everyone coming in and out all the time through the garage, it will just be in the way. The way our house in configured, most people will be coming in the back. I don't mind, growing up, everyone use to come in our back door. This welcome sign use to hang in our front entry, but I decided to hang it in our laundry room for now. The next room I'd like to share is our half bath. It's sorta off our entry, but not in a awkward sort of way. It's actually in a very good place. I love the vanity and mirror. We had to add towel and toilet paper holders. None of our bathrooms had them. We thought that was a bit odd. Not sure where they put their hand towels and toilet paper. I love the beach and I love my kids, so I hung pictures of children on the beach in this bathroom. Most of them were of our kids, like this one. I took this of Miles and Ashley when we first moved to Wilmington, NC. I just love this picture. As you can see, we have not painted. I think I know what I want, but not sure. We have decided to go ahead and settle in and live with what is here for awhile before we decide to do any painting. Interesting thing is, some of the paint that is here I didn't think I would like, but it has grown on me. Well, that's all for now. There will be more of our house in future posts. When you think of school mascots, you usually think of tigers, or cougars, or bears. Sometimes it's Eagles or panthers; anything that is tough or strong. I've even heard of tornadoes or hurricanes which can be pretty devastating. Just recently, we moved to Kentucky. You know home of the UK Wildcats? When we lived in Louisiana, you were always engulfed with purple and gold tigers. Here in Kentucky it's blue and white wildcats. Anyway, in our new little town the high school my youngest son will finish out his senior year at has a most unusual mascot. When I first came here and visited the school, I noticed that they were the Maroons, and their colors were maroon, white and black. Was kinda sad to leave the beautiful colors of our Louisiana high school. They were the Panthers and their colors were cobalt blue, white and black. Really pretty colors. Well, we are not the mighty, mighty panthers anymore. I inquired about our new high school's mascot, and no one really would answer, so I looked up the definition of a Maroon. Most of the definitions say that it is a color, or that it is when you are stranded somewhere like a deserted island. Then I found another definition on merriemwebster.com, a fugitive black slave of the West Indies and Guiana in the 17th and 18th centuries. Hmmmmm. Doubt that would be their mascot. 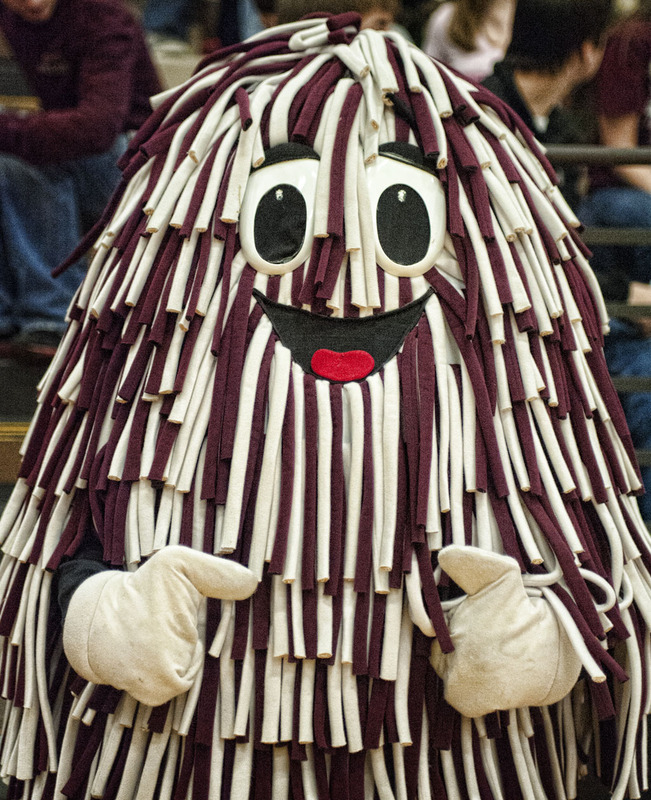 So I asked my realtor, and she laughed and told me that their mascot was a mop. I looked at her and started to laugh along with her. Seriously? Well, then (clear throat), I searched the net for a picture; and sure enough I found a picture of a cute little mop as their mascot. I half way jokingly asked, "What do they do to their opponent? Hit them over the head with a mop? hahahahahah!" I guess that could hurt someone pretty bad. Ok, now, we are getting ready to head across the state to a big soccer tournament. When my oldest son played soccer and wrestled at his high school, they were the Delta Eagles. Their colors were blue and gold. Our other son played football and baseball for the Sterlington Panthers. I've already told you about their colors. Both schools, I made jewelry to wear to all the sporting events. I even sold some to a few of the parents. Now our third son will be playing for the Maroons, and I need to come up with something to wear to the soccer tournament in a few weeks, and then for the rest of the season. It's very easy to find Eagles and Panther paws. Not sure what I'm going to come up with for the Maroons. I do have some ideas, so stay tuned to see what I come up with. You have to admit, he is kinda cute, don't ya think? JUST A FEW MORE WEEKS 'TIL SCHOOL! This summer sure has flown by. I can't believe it is already getting toward the end of July. Seems the older I get, the faster time flies. Another thing I can't believe, is when school starts. This year it starts on August 8! That is WAY too early. I can remember school starting after Labor Day, and we would get out just after Memorial Day. My birthday is in August, and I can remember when I was school age, August was always the fun summer month. Time to hit the beaches and pool for some fun in the sun. On the calendar, you would always see something summery, like a beach ball or swimming pool. Now you see a big fat red apple. I don't like that. Well, I won't have to worry about it anymore because my baby will be a Senior this year. This will be our last year of school stuff. It's kind of bitter sweet. I surly will not miss a lot of the school rigamarow, or will I? Honestly, I'm really not sure. One thing I am sure of though, is that I'm kinda sad to see my kids grow up. Don't get me wrong, I am happy, they are growing to be competent adults, I'm just selfish to see them leave the nest. Our family really had some nice years with the young'ns. our two youngest are in the front row in red and dark blue shirts. Alright, folks, I need some help. No, not that kind. I need help with my front window. It is a gorgeous window, but there is one big problem. The problem happens every afternoon, about time for me to start dinner. You see our house faces West. Because of this, the sun shines right into this enormous window down the hall and into my kitchen, right where I stand to fix dinner; and boy does it every get HOT! There are a few other issues with the sun shining into the window; one being the electric bill and the other being, well, whatever pictures/art I hang on the wall, is probably going to fade. Right now, I have some large metal butterflies hanging there, which look fine. Originally, I wanted to hang my large painting I have of the North Carolina coast; but I don't want it fading. So, the butterflies will stay, until I can figure something else out. Which leads me to you. Do any of you have a suggestion? I have a few ideas, but I would like to see what other's have to say about maybe what they have done with a window like this. Not really sure what the previous owners did, since they were pretty much out of the house when we looked. I do know they had some trees on either side of the window, but that really doesn't help the situation with the sun. I thought of maybe putting some type of white sheers up to diffuse the light. Then I would just add the things I plan to put up there...large vases. Not sure what the curtains would look like though. Do you know of anyone that has put something like that on windows like these? I still want to be able to see out a little, and have some light in, but not have that glaring sun shining in. When we first started looking for a house here in Kentucky, we were told there were a lot of deer. On one of our outings, that was confirmed when we came around a corner to see not just a few deer, but, like a DOZEN deer in the middle of the road. Just standing there, looking at us. We knew then, that no matter what house we would pick, we would need a fence; a high one. One that would not only keep our dog in the yard, but deer out of the yard and out of our garden. The other morning, my mom yelled for me to come down stairs quick, with my camera. As I came down and into the kitchen, what did I see? And she saw me too! We see deer all the time, but this one got really close. I took this picture from our deck. Isn't she pretty? Then last night, my husband and the boys went outside the garage door, and noticed several deer out grazing. We've been in the house for almost two weeks, and I love seeing the deer. I've been told it will get old, but I'm not sure about that. I do know that whatever fence we get, I still want to have the beautiful view that exists our our back door. We have been soooo busy lately, unpacking boxes, setting up house and taking things to Good Will. I probably could have had a magnificent garage sale, but I just wanted the stuff out of here...NOW!!! So off to being donated it went. In addition to being so busy with the move, I also signed up for the 6th Bead Soup Blog, and boy am I EVER excited. It took me awhile to find my bead stash so I could pick out some stuff for my Bead Soup partner. After taking some time locating it, I sat down with my mom who has been so nice to come and help, and we picked out some pretty beads. Sometime ago, I ordered a bunch of freshwater pearls. I just love freshwater pearls, especially the colored ones. Not many people like pink, but I do, so I went ahead and shared a strand of these pretty pink freshwater pearls, thinking it could be a little challenging; especially if she isn't into pink. As I searched through my stash of pendants, I decided to send her this fleur de lis. It is one of my last large ones, and the reason I sent it was because, well, we have been moving from Louisiana, and I decided to send her a bit of Cajun culture. I had a challenge as to what clasp to send. I never did find my stash of clasps. Since we moved to a small town, there are NO craft stores around. The closest is about an hour away, so I headed to Wally World (better know as Walmart), and guess what?! They actually have a pretty good selection of beads. Not so much in the clasp area, so I put this one together for her. It's not anything to write home to mom about, but at least it is not just a plain ole lobster clasp. I figured this would look good dangling down the back. For my birthday, my sister sent me some of these beads. I had a couple left, and thought they would go nicely with the beads, so, in they went. Now all I needed was some bling. About the same time I ordered the pearls, I had also ordered some colored crystals. I thought these would be the perfect match. I just received my Bead Soup ingredients and boy, am I EVER a lucky girl!!!!! Look at all this STUFF!!! When I went out to the mail box, I noticed it pretty much filled the box up, not to mention it was pretty heavy. Of course, I ran in the door, and dug right in! I'll take you through my package bag by bag. Sorry, but some of the photos are not all that great. The lighting was really bad when I took these, but in this bag there were a couple of clasps and various spacer beads. The silver clasp was in another bag all by itself. Here's some butterskotch. I LOVE butterskotch mmmmm! What about these groovy beads? I already have plans for these babies! I believe this is my challenge bag. Shawn said something about sending me a challenge, something about wire wrapping. Wish me luck! Got plans for these too. Last but not least...Sorry for the horrible picture! But...I think I might know what I want to do with this. Not sure, but stay tuned to see what creations I come up with. It will be creations (plural) fo sho!!! !